i Click 'view all' to instantly compare this good deal with offers on other top personalized cutting boards. 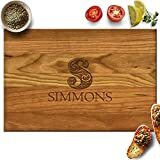 Personalized Cutting Board, Wedding Gift, Family Last Name Engraved is currently selling at $44.99, approximately $0.16 lower than average, giving a potential saving of $11.00 right now. With a lowest price of $44.99 and an average of $45.15 it is selling on the low end of its usual range. Price volatility is 0.45% (meaning it does not change often), so the price should stay low for a while. Right now this product is a recommended 'good deal'. There is a coupon available for an additional 20% off. The current deal is also the best price on this item over the last month. 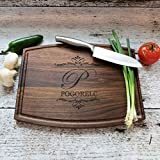 Compare the current price, savings (in dollars & percent) and Buy Ratings for the top Personalized Cutting Boards that are closely related to Personalized Cutting Board, Wedding Gift, Family Last Name Engraved. Here is how Personalized Cutting Board, Wedding Gift, Family Last Name Engraved compares with other leading Personalized Cutting Boards. Cutting board size is 13.75 inch X 9.75 inch and 3/4 inch thickness Our personalized cutting boards are engraved with industry leading laser machine, to create very detail and precise unique loved once. It is perfect for wedding gifts, anniversary gifts, housewarming gifts, Valentines Day gift, Father's Day gift, Mother's Day gift, kitchen decor or for special occasion. FeaturesCustomization : HOW TO PROVIDE ENGRAVING ==> Just click the Customize Now button to the right and get started! Please enter customization related information at "Customize Now".PLEASE make sure to check the customization info. 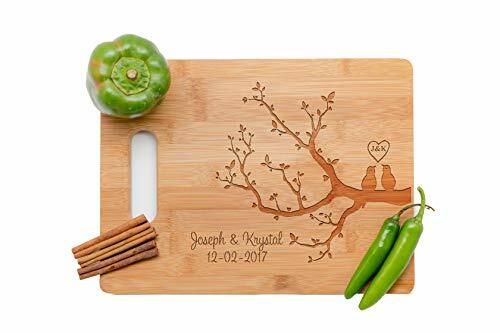 we will engrave it exactly how it is entered.Best gift for wedding,Birthday Gift or anniversary giftThis engraved wooden cutting board is 11.50 inch X 8.75 inch in dimension and 3/8 inch thick. Please note, because every piece of wood is unique, engraving coloration may be slightly lighter or darker than pictured.cutting board would make a thoughtful gift that is sure to be treasured for many years to come. Lovingly crafted in our small workshop, it will make a special gift for weddings, anniversaries, birthdays, or any other special events in the lives of your family and friends.